Ahhh, I'm so excited! 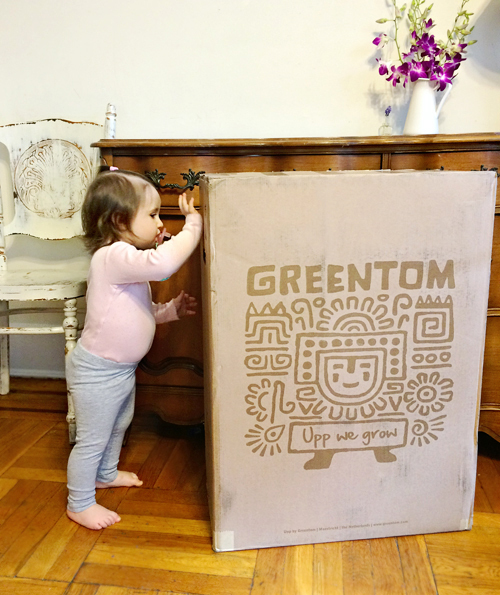 The Greentom Upp Classic has arrived! The whole family gathered around to witness the unpacking, but I had to take pictures of the box first. It's funny, my two older kids roll their eyes every time another stroller appears in our house, yet they're still curious and about each one and enjoy test-driving them. I'd like to think that I'm raising little stroller connoisseurs. Back to the new arrival. The Upp stroller required minimal assembly and was ready to go within minutes. It came in 3 parts, the frame with seat, canopy and a bumper bar. All we had to do, was pull the stroller out of the box, unfold the frame and attach the canopy and belly-bar. Everything else, the wheels, seat fabric and basket was already attached. I love gear that doesn't over complicate my life! The Greentom Upp Classic is a unique stroller, made entirely out of recycled materials. It's easy on the planet and easy on the eyes. The stroller is very minimalistic looking with a clean, modern design. I was also impressed with how lightweight it is. I was able to lift the stroller effortlessly with one hand! Of course Little Missy had to climb right in, which she accomplished without any assistance from us. Once in the stroller, she sat back and was very relaxed and content. 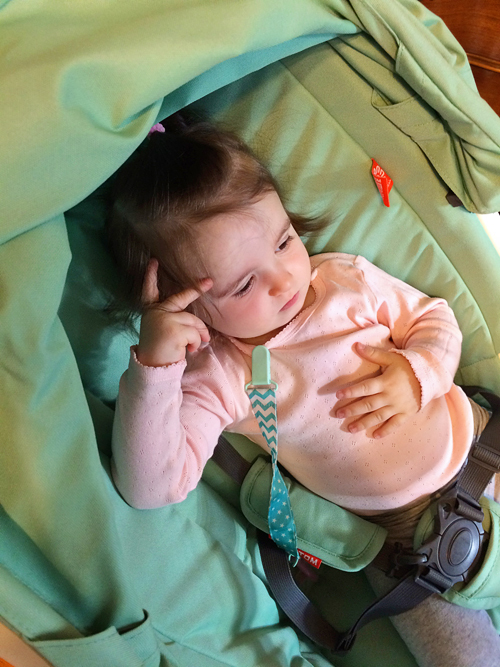 While the stroller is pretty compact, the seat is very roomy. I'm looking forward using the Greentom Upp on our Spring outings and will post a full review soon.